What a fun time of the year! I can feel the buzz of excitement from our blogging community as it is preparing for the holidays. I just love it!! Bonnie and I are so excited to see what you have been up to this week! Live, Laugh, Rowe is a lifestyle blog that is full of crafting tutorials, DIY projects, recipes, fashion fun, blogging tips, and inspirational stories. Kelly also hosts Thee Networking Blog Hop where you are sure to connect with lots of new blogging friends! the post is nice too! feature your project on our social media outlets! twitter, so we would love to have you follow there as well! 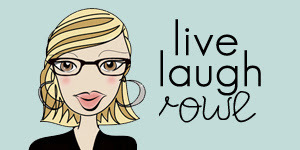 We’d like to thank Live, Laugh, Rowe again for sponsoring this week’s link party! Thanks a million for the party…such a fab sponsor by the way!! Thank you so much for hosting, girls! Thanks for hosting, this is my first time linking up! Thanks for hosting! Have a beautiful day tomorrow! Thanks for hosting a great party! Enjoy the rest of your week! Thanks for hosting, hope you are enjoying a good week! Thanks for hosting, ladies. I missed last week, so I shared a few extra links. I hope you both have a great week! Thanks for hosting, ladies. Hope you have a great week! Thanks for hosting, Bonnie and Trish! Hope you are having a great week! Thanks for hosting each week Trish and Bonnie! You are always an inspiration!